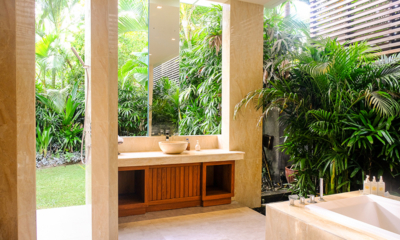 A grand modern palace inspired by Morocco with luxe bathrooms in the heart of Seminyak. The Sayang D’Amour is a 6-bedroom luxury villa with its own distinct style-very Moroccan in its interiors, French in its architectural style but truly Balinese in its hospitality and setting. Perhaps one of the most sought after villas in the Petitenget area of Seminyak, the villa boasts not only of facilities for a large entourage of guests but also of having the distinction of providing you the best in terms of facilities and quality holiday living. The Villa possesses six gorgeously decorate bedrooms that are large and airy with hand-knotted durries and carpeting, soft natural furnishings and large windows. The curios and artifacts are Mediterranean and strongly Moroccan period pieces that will enthrall you with their beauty. The cool white walls, and the jewel colors of the furnishings add a look of decadent luxury to the place. The open plan living room has a fascinating turquoise tile work on the floor blending well with the teal sofas and the white walls. There is not a single dull spot in the interiors of the villa . From the hand carved furniture with their brass highlights to the soft glowing lighting, the design details are immaculate. At night the villa takes on different look-the lights of the glittering chandeliers, the pool all lit up in a gorgeous deep blue, the recliners inviting and tempting as the air turns cool and the palms sway majestically announcing that time of the day when the outdoors is the place to be. The villa can arrange for dinner outdoors in the fabulous gazebo that has adequate seating for the whole group. If the morning was spend in the resplendence of the interiors the evening can be outdoors barbecuing with the family. The bedrooms provide a cool refuge after a day’s hectic activities at the Seminyak shopping district. You could soak in a scented bath that the maid could fix for you or order a made as per menu meal for your family-the chef will be only too happy to create a surprise local meal for you, though he is adept at all kinds of cuisines. Do use the spa services at just a little extra cost and enjoy massages and treatments the eastern way. 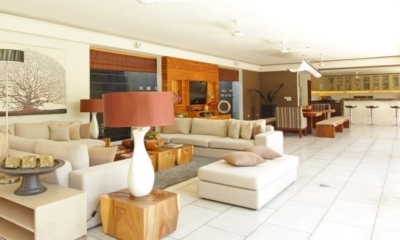 Those who like to stay connected with the world will fond plenty to do-with satellite TV, internet access, books and DVDs from the library-you can plenty of in-house entertainment if ever you need to shift your attention from the pool and the lawns. Villa Syang D’Amour translates to mean ‘sweet love’ and that is what you will feel all along in its hospitality and quality of service.